As you can see from the picture, Bill Maher and I are close. Really close. Less than two feet away. If you're jealous, I don't blame you. Being BFF with Bill is a dream come true for so many Americans and I just feel so darned fortunate to be the one he chose. Can life get any better? Maybe, but it could also get a lot worse. Like if Bill Maher saw this post and demanded I remove it because I lied about being his BFF. That would be worse. So I'll come clean. My Crazy Half-Nekked Wife and I were at the annual Humane Society's Genesis Awards last weekend in Beverly Hills and sat next to Maher at our banquet table. It was just as exciting as you might imagine, but without the excitement. We're big fans of his, but in a situation like this, in order to be cool you have to act like you're not. Even saying "big fan, Bill" seems kind of cheesy. Like something a Rush Limbaugh listener from Topeka would do if he met that pumpkin-headed, lying blowhard just before he raised his shirt up and asked him to sign his beer gut. So you try to make casual conversation and pretend to be interested in other people at the table, too. Our table was actually pretty cool, (thanks to Karen Dawn, author of the soon-to-be-published "Thanking the Monkey") so it was easy to do, but I didn't find a way to gracefully tell him I think his show is genius. And I didn't find a casual way to explain that I think his imput is essential to political awareness in America. And I wasn't able to mention that I'd let him spend the weekend with my Crazy Half-Nekked Wife if he'd invite me to be a guest on his show. And what a terrific guest I'd make, don't you agree? I'm far above asking my friends and readers to write in to Real Time With Bill Maher (http://www.hbo.com/corpinfo/faq.shtml)and ask them to consider me as a guest, but if they did, boy, that would be a special thing that I would remember for as long as I could. Where was Crazy Half-Nekked Wife while I was booty shaking with Rory? 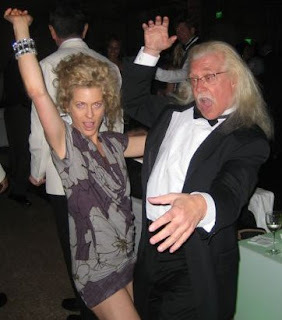 Dirty dancing with Bob Zmuda, of Andy Kaufman fame. Not all vegans are buzzkills, my peeps. made the suggestion.. you are worthy, my friend. you guys are just too cute. how can bill deny that you and him are not BFFs? the proof is in the photo, you're so close you can eat cake off his face! well, because that's what BFFs do, eat cake off each others faces. good read d, i enjoyed this posting. "We're big fans of his, but in a situation like this, in order to be cool you have to act like you're not. Even saying "big fan, Bill" seems kind of cheesy." 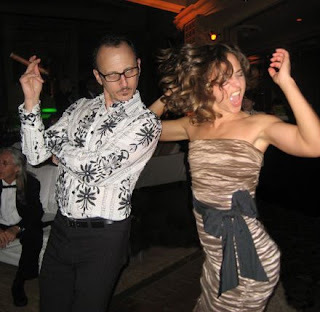 That's what I felt like when I got to chat with you at that party in Honolulu a few months back. But I just went ahead and told you I was a big fan, anyway. In that photo, Bill Maher looks a bit like Anderson Cooper of CNN. Separated at birth? Bill Maher is a brilliant, wildly creative, courageous, hysterical sagacious vanguard who is absolutely unafraid to speak his mind... just like Dan Piraro. 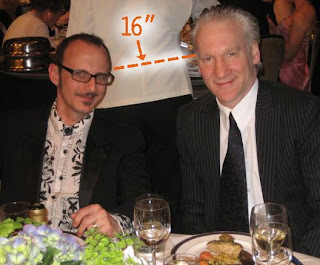 Geez, Dan... it's only Bill Maher... and don't even offer him your wife - he might take you up on it. Even worse, Ann Coulter either is or was his girlfriend! All together now, "Ewwwwwwwwwwwwwwwww!" Cooties! Cooties! Run away, fast! I wrote a quick suggestion. lol at the measuring between you and bill... so jealous!